The manner of their victory was decisive, and they dazzled the Canadiens under their own rules. 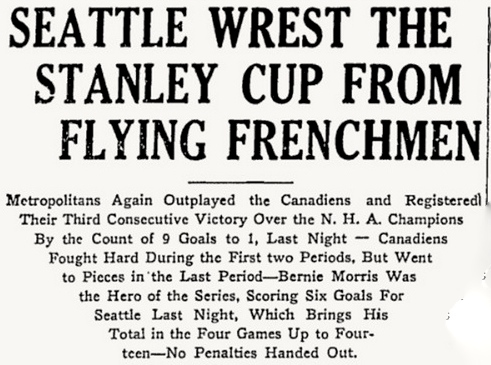 I’m quoting here, from The Ottawa Citizen’s report on the Seattle Metropolitans 9-1 “regular rout” of Montreal’s Canadiens, which on this day in 1917 won the former a Stanley Cup, the first ever for an American team. The Montreal Daily Mail said that without Georges Vézina in the Montreal net, the score would have been much more. The Montreal defence put up a creditable performance in the first and second, but in the third they collapsed. “Their forwards also went to pieces, the Seattle team running in goal after goal and making a farcical runaway of it,” said The Citizen. The only thing to save Montreal from “the humiliating coat of a whitewash” was Didier Pitre’s goal. So: not such a great day in Canadiens history, this one. They had won the opening game of the series, all four of which were played at the Seattle Ice Arena. 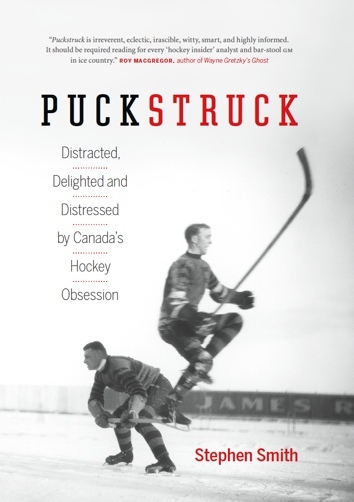 The games alternated between west-coast and eastern rules, which is to say that in games one and three, seven players skated for each team and forward passing was permitted while in games two and four six players relied on back and lateral passes. This was a Montreal team that counted Pitre, Con Corbeau, Newsy Lalonde, and Jack Laviolette in the line-up, but they faltered after that first 8-4 win, losing 6-1 and 4-1 before the final debacle. If you’ve read Stephen J. Harper’s A Great Game (2013), you’ll recognize the names on the Seattle scorecard, many of which had featured when the Toronto Blueshirts won the Cup in 1914 before migrating to the Pacific coast. Hap Holmes was the goaltender, with Jack Walker on defence in front of him, Frank Foyston up at the front. I don’t mean to be rude on so auspicious a day for Seattle hockey, but the Metropolitans who (The Citizen) “skated off the ice, surrounded and cheered by the echo, champions of the world,” were sons of Minesing, Ontario, (Foyston) and Aurora (Holmes), Winnipeg (Cully Wilson) and Brandon (Bernie Morris), Bayfield, New Brunswick (Jim Riley), Ottawa (Roy Rickey) and Port Arthur (Walker). Eddie Carpenter, at cover, was from Hartford, Michigan, though. That’s true.